The Minister for Justice also addressed the breath test scandal in a speech in the Garda College. 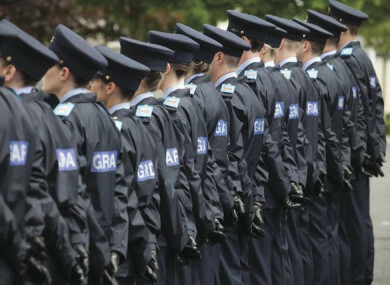 THE ACTING COMMISSIONER of the gardaí described the recent breath test scandal as a “collective failing” in a speech at a passing out ceremony for 181 new Garda members today. A report published earlier this month found over 1.4 million breath tests had been faked on the garda PULSE system over a six-year period. Speaking in the Garda College in Templemore, Co Tipperary, today acting Garda Commissioner Dónall Ó Cualáin said the scandal could be partially blamed on “antiquated systems and processes”. However he added that all members of the force are responsible for fixing the problem and ensuring high standards are met. This is a collective failing. No one individual is responsible. We are all responsible. From top down to bottom up. “When something does go wrong though we should put our hands up and tell the truth,” Ó Cualáin added. That we don’t portray as a mistake a series of actions that were not intended for the public good and that went on a lot longer than any mistake goes on. Mr Ó Cualáin took on the role of acting Commissioner following the retirement of Nóirín O’Sullivan earlier this month. He told the new gardaí that he does not believe morale in the force is as low as is being claimed. However speaking to the media after the ceremony Deputy Commissioner John Twomey admitted that the controversy has damaged the force. The minister for justice Charlie Flanagan also addressed the scandal in his speech in Templemore. “I can understand that some of you today might feel a little apprehensive about the future as many controversies have arisen in the context of An Garda Síochána in recent times,” Flanagan said. An Garda Síochána will come through this period of controversy as a stronger, more cohesive, police service better equipped organisationally to meet the many complex challenges it faces day in and day out. Email “'We are all responsible': Acting Garda Commissioner addresses controversies in speech to new gardaí”. Feedback on “'We are all responsible': Acting Garda Commissioner addresses controversies in speech to new gardaí”.